“I have completed a Diploma of Remedial Massage and Diploma of Musculoskeletal Therapy. I also have a Bachelor of Science(Human Biology & Exercise and Sports Science) ECU. Ryan specializes in managing and preventing musculoskeletal dysfunction. His training has given him a detailed knowledge of the body and its dysfunction, enabling him to complete comprehensive assessment and treatment. Every session begins with an assessment to ensure the treatment is as effective as possible. Ryan aim to educate clients regarding potential causes of symptoms and ongoing management. 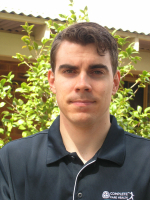 He is passionate about treating people and improving Musculoskeletal function. He helps people to manage their pain and educate them in self management. He is methodical and focused on the root cause of the pain not just the symptoms. He loves helping people, seeing them happy, feeling better and moving freely. He is a member of Massage and Myotherapy Australia(previously AAMT), the premier association for Remedial Massage Therapists in Australia.